I hold to what I said almost a year ago: Pancakes are fine. Great in fact! They're probably the first thing I learned to cook on my own. But waffles are intrinsically superior unless you are looking for maximum volume in the shortest time frame. I really wouldn't pick one over the other. Well done waffles have a texture that just can't be matched by pancakes. However the fluffiness of pancakes can be divine and unlike waffles they can be stuffed with delicious ingredients like ricotta, marscapone, and blueberries. So... it really depends on the mood I'm in. So... Al Capone hid his money on Mars? Did he keep any mascarpone with it? I cannot be the only one who has heard of stuffed waffles, can I? The flames of war ignite! 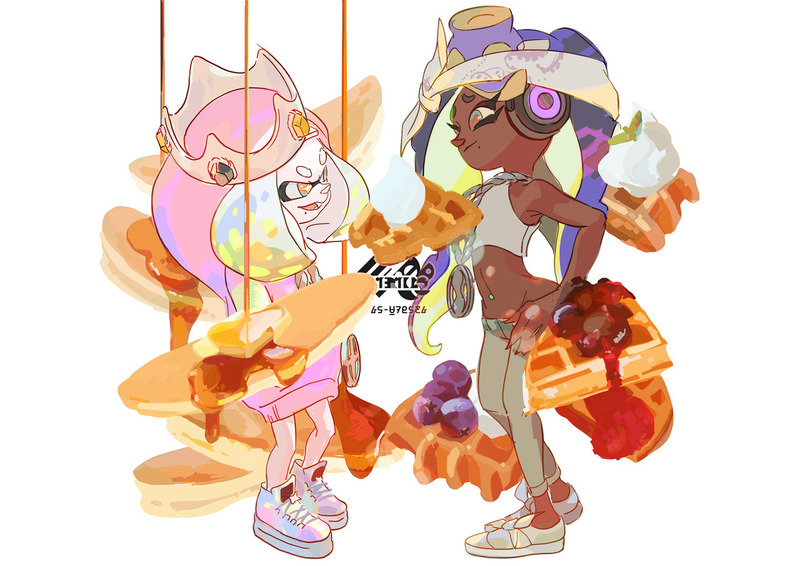 The big breakfast Splatfest is right around the corner! Whether you’re Team Pancakes or Team Waffles, the safe money is on Team Syrup! The Splatfest kicks off this Friday, February 8th, at 8pm PT until 2/9 at 8pm PT. Can I have toast instead? I'd rather have toast. Callie and Marie are competing over English muffins and standard muffins in an alternate reality where Splatoon 1 still gets Splatfests. Geez, what are you - an anime character?